Sitting by the Deschutes River in Bend, Oregon. Scooped water for painting right out of the river and sat watching afternoon light move across the basalt. The igneous origins of the high desert are evident everywhere. To the west are snow-covered volcanoes–Mt. Jefferson, the Three Sisters, Broken Top, as well as the perfect cinder cone of Black Butte. 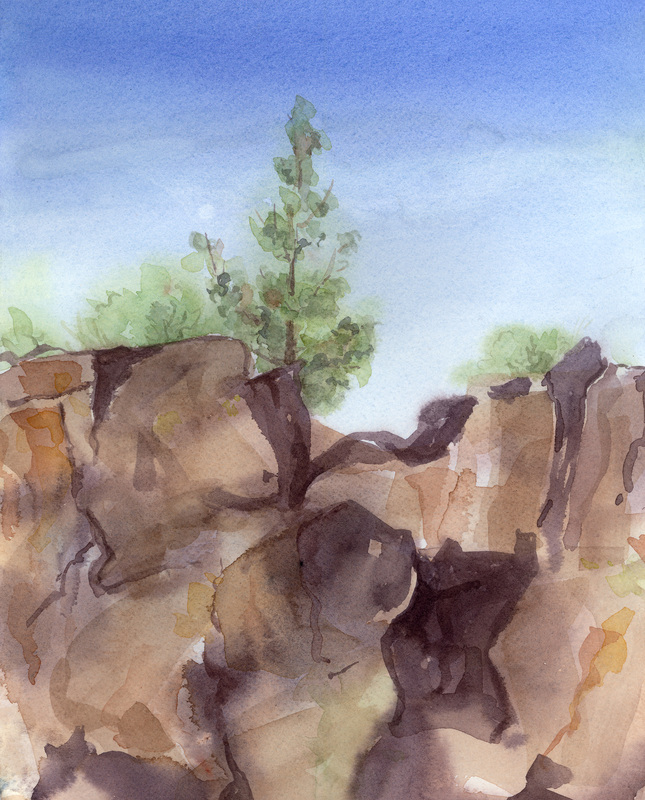 Central Oregon is a plateau of flood basalt, and there are lava beds. It seems like gentle country, with rolling terrain cloaked in ponderosa pine and juniper–until you come to a steep canyon with a river in the bottom of it, and precipitous cliffs. The air is clear in the desert, and I mixed colors for quite awhile before I laid down the sky. There is no way I could capture the purity of it on paper. Imagine the bluest sky blue, light at the horizon and deepening as you look upward. Then place a sense of great distance behind that, a knowing that it just goes on and on. The sun is benevolent, the air soft and warm. The river flows by, each drop of water moving and adding to the chorus of notes that makes the song of the Deschutes. Violet-green swallows swoop and cartwheel. And I am there painting, finding a way to express light on rock and juniper with quinacridone orange and gold, ultramarine blue, and cobalt teal. I paint until I am ready to leave, but I know I am never done.